This mechanically styled juggling act shines at festivals, large parties, and conventions -- any setting where crowds mill about. Combining poetry and juggling, "The Animated Blake" and "Ta-Da Dada" put a new spin on literary entertainment. These pieces present intricate and graceful juggling choreography as "kinetic songs." 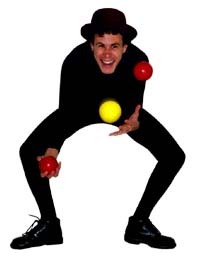 James Jay's introductory juggling lessons, with balls or scarves, include tips on how to make your own props to take home with you. To customize a performance that will best suit your needs, email jamesjay@jamesjay.com.